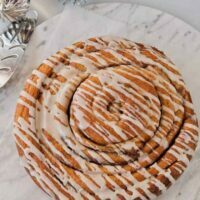 Try A Texas-Sized Cinnamon Roll from Your Bread Machine that fills an 8-inch round pan adding a fun twist to a holiday cinnamon roll tradition. This recipe makes 2 pans. No bread machine? See these instructions for converting this recipe to be mixed by hand or a stand mixer in the notes at the end of the recipe. Do you have a Christmas breakfast tradition? 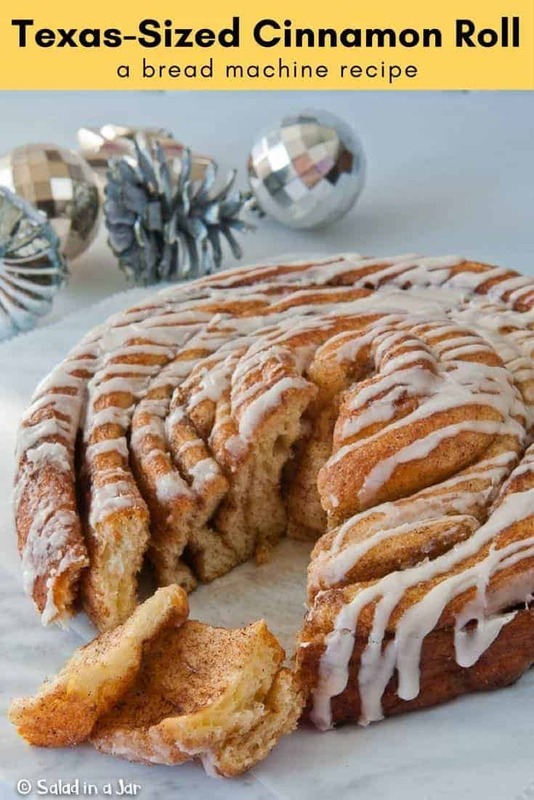 At our house, Christmas morning without cinnamon rolls would be like a tree without lights. We must have them. My recipe is pretty much traditional, but no harm in changing up the appearance. Right? I’m always looking for a new twist on tradition, and this variation seems pretty harmless. After modifying my original cinnamon roll recipe just slightly, these rolls are a touch richer and even more delicious. 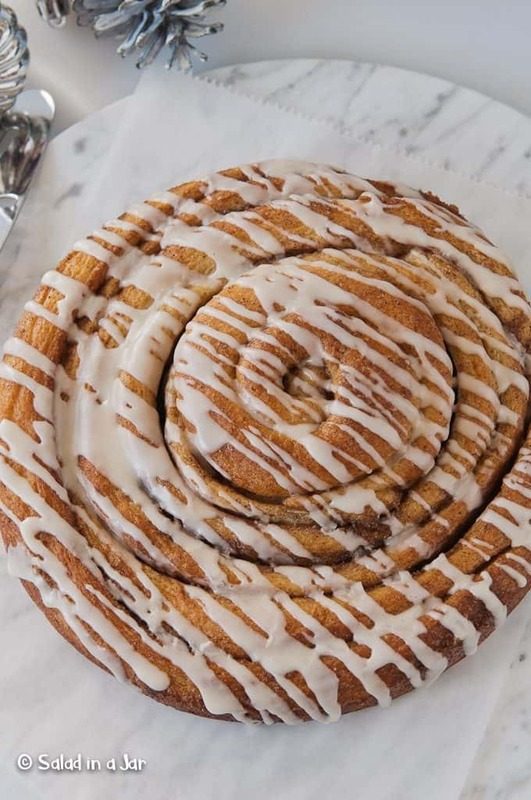 As can be seen in the picture below, rolling out the dough for this Texas-sized Cinnamon Roll From Your Bread Machine is a departure from the classic method. I will try my best to describe the process but if you are confused, feel free to email me or leave your question in the comments. I have a new vice called Homemade Chai Spice Blend from a blog named Perry’s Plate. Not only is it remarkable in many of the foods the blog-author suggests, but also with some of my own ideas. 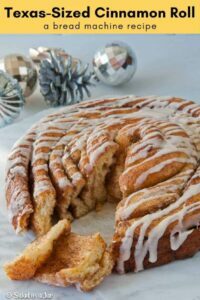 Try it as a substitute for plain cinnamon in the filling of this huge cinnamon roll for a taste experience you won’t soon forget. That being said, you can’t go wrong with the traditional brown sugar and cinnamon filling. Finally, let me say Merry Christmas to all of you, my dear readers. I’ll see you after the New Year in 2018. A bread maker is one of my best friends in the kitchen. However, I don’t use it as most people do. Instead, I only use the machine to mix and knead the dough. Then I shape the dough by hand and bake it in a conventional oven. If you are curious about my method, see this page for more details. Alternatively, instructions for using a stand mixer are in the recipe notes. Warm the milk and cream to lukewarm. (1 minute in the microwave is perfect.) Add to the pan already placed in the bread machine with the blades in place. Add remaining ingredients to bread machine pan in order given. Choose the dough cycle on your bread machine and press "Start." Leave the lid open and check the dough after about 5-10 minutes. The dough should stick to the side and then pull away. 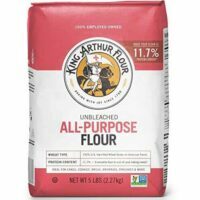 If it doesn't pull away, add more flour, 1 tablespoon at a time. If it doesn't stick at all, add more milk, 1 tablespoon at a time until it "sticks then pulls away". (See the pictures on this post if you are unsure at this point.) Close lid on machine and allow the machine to finish the dough cycle which will include time for the dough to rise. When machine beeps, check dough. If it has not doubled in size, leave it alone and let it continue to proof inside the bread machine until it has doubled. Prepare two 8-inch non-stick round pans (gold or dark-colored work best). Spray the inside of each with Baker's Joy. This works like a charm when it comes time to get the cinnamon roll out of the pan. Set aside. 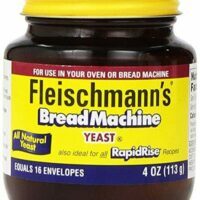 Gently remove risen dough from the bread machine onto a floured surface. Divide the dough in half. Roll one-half of the dough into a 7 1/2 inch by 16 1/2 inch rectangle as pictured above. Slather 2 tablespoons of softened butter onto the dough and spread to the edges of the rectangle. Combine the brown sugar and cinnamon in a small bowl and sprinkle half the filling evenly over the butter. Cut five pieces of dough that are approximately 1 1/2 inches wide and 16 1/2 inches long. Let strips rest for about 15 minutes or until they start to become a little puffy. Take one strip and loosely roll it up like a bandage. Pick up the next strip, slightly overlapping where the first strip ended, and continue wrapping the strip, always putting the buttered side with sugar towards the inside. After you have wrapped 2-3 strips, go ahead and transfer the roll to your prepared pan as it will become difficult to hold together without wrapping it too tightly. Continue to wrap the remaining strips in the same way except that now you will just lay the strips into position horizontally up against the roll as you make your way around the outer edge. It's important not to stretch the dough or wrap it tightly because the dough needs room to grow as it proofs. Repeat the process with the other half of the dough in the second pan. Loosely cover both pans with plastic wrap and set in a warm place to proof. When dough is almost double in size (45 minutes to 1 hour or more depending on the ambient temperature), set oven to 350 degrees F to preheat. Rolls may rise unevenly and be much higher in the middle than the outside. If necessary, before placing rolls into the oven, gently mash on top of the plastic wrap with your fingers to push the dough in the middle down and towards the edge so the roll is level. Be careful not to press air out. The idea is just to redistribute it. Don't worry, the dough will spring back when it hits the oven. Remove the plastic wrap. Bake at 350 degrees in preheated oven for about 22-25 minutes or until rolls are evenly browned on top. Remove from oven and allow rolls to sit for about 10 minutes. Use a plastic knife to loosen rolls from the pan and place them onto your serving dish. Make icing while the rolls bake. Combine coffee (or milk if you prefer) with the sugar. Add enough heavy cream to make a pourable consistency. Drizzle icing over the top. 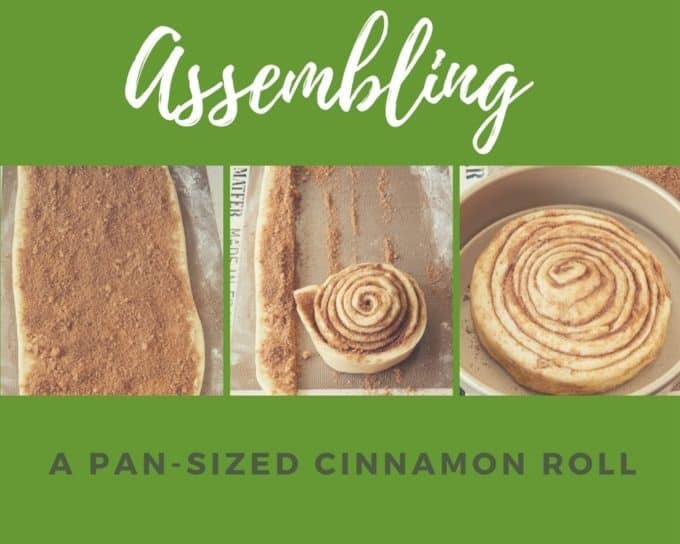 If you want to assemble this the night before, place in the refrigerator after you have formed the roll but before it rises the second time. Remove rolls from the fridge approximately 2 hours before you want to bake them. They will need to rise to almost double their original size. 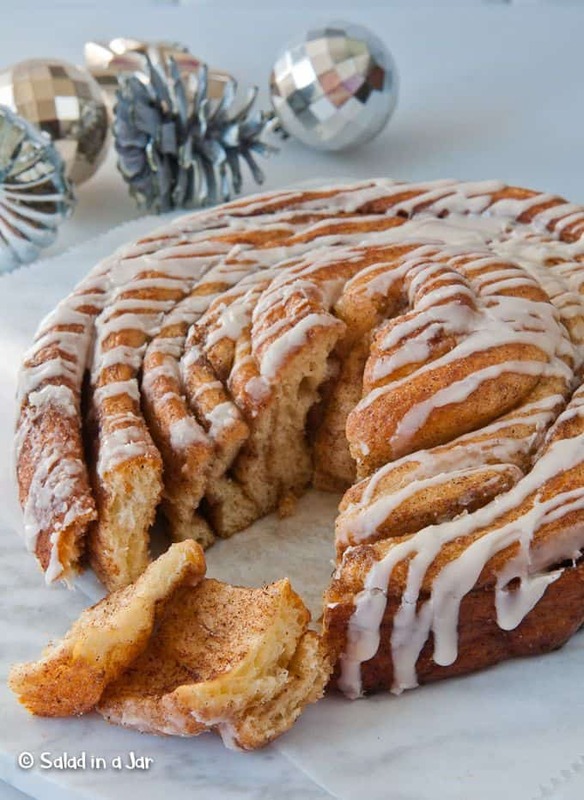 We love Cinnamon Rolls at Christmas too – this giant one looks amazing! Hope you had a very Merry Christmas! We had a wonderful Christmas, Betty. Hope you did, too. Happy New Year! 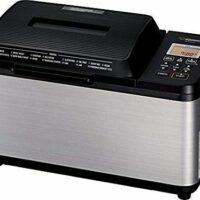 Hi Paula , I am looking to buy a bread machine , may I have the name of your machine , I would like to buy the same . I would try your rolls for this holiday season . Thank you and wishing you and your family a Merry Christmas and Happy New Year ! Mine is a Zojirushi. They are spendy but it seemed the best when I bought it a few years ago. Still going strong. Merry Christmas to you, too. Hi. When I open my bread machine lid, it stops. I have the same bread machine you have, which I love. I have to use a toothpick to depress the button inside a small hole to keep it running. Any suggestions or tips. Thanks. Wishing you and your family a very Merry Christmas. Thanks for a wonder blog with awesome recipes. I’ve never hear of a bread machine like that. Is there a window you can watch? I hope so. Merry Christmas to you, too.